Yesterday's game was not close. 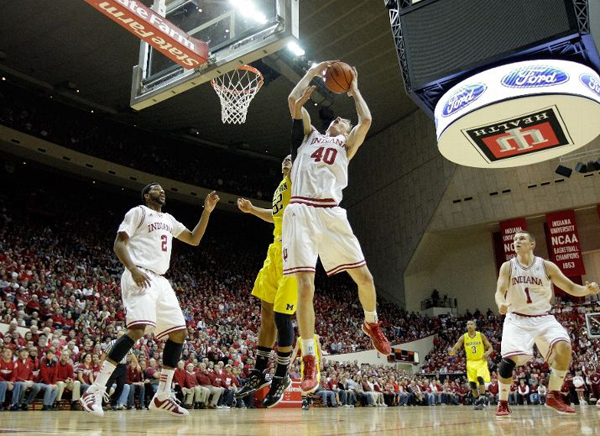 I know the scoreboard says Michigan only lost by 2 points, but that game was totally dominated by the Hoosiers. Michigan allowed Indiana to shoot 55% from the field, including 63% from outside (most of which were completely uncontested). The teams had equal rebounds, Indiana had two more assists and five more blocks, and Michigan only held onto the ball slightly better than the Hoosiers (12 and 15 turnovers respectively). Three more made three pointers by the Wolverines and seven missed free throws by Indiana is the only thing that kept this game close. The main reason for the loss: athleticism. Michigan got kind of exposed last night. It will surprise no one that Stu Douglass and Zack Novak are less athletic than some of their counter parts (spot up three-point shooters tend to be), but just how much less athletic was put in stark contrast last night. Sure, not every team has someone as electric as Victor Oladipo, but Michigan simply could not keep up with that team last night. They were faster and stronger at basically every position, which resulted in contested shots for the Wolverines, blow bys on the defensive end, and an inability to get open, both on and off the ball (I've never seen back cuts defended so well without giving up anything on the frontside; Indiana is just that much faster). This leads me to my next point of contention which I will be widely derided for: Tim Hardaway Jr. is not very fast. He can jump pretty high and has decent straight-line speed, but his first step is devastatingly slow. There's a reason you can barely give him the ball in isolation situations on the offensive end: he can't beat his man off the dribble. Similarly, this lack of quickness is one of the primary reasons that he's such an abhorrent defender. If you didn't believe it before, you should after last night. And on nights when he's going 0/7 from outside, he's as much a detriment to the team as a benefit (19 points on 19 shots from your star player is not a recipe for success). Jordan Morgan did a really good job defending Cody Zeller last night, despite his still positive stat line. Morgan denied passes into the post by fronting Zeller all game and was quick enough to get back into position so as not to allow lob passes or anything inside. Evan Smotrycz. Damn, kid can shoot. Can't dribble. Can't pass. Loves fouling. But boy can he shoot. Enough has been said about Trey Burke to date, and I'm not sure I have much more to offer. He does have one of the softest shots I've ever seen. I'm not really sure why, or whether or not it's less effective because of it, but his shots flutter in a way that I don't think I've ever seen before. Especially from outside, he seems to heave the ball more than shoot it. I expect his outside shooting to improve dramatically whenever Michigan's coaches really have a chance to mold his form (probably not until the offseason). As MGoBlog mentioned yesterday, this loss doesn't really hurt Michigan's NCAA Tourny resume, but they're going to need a few of these games against ranked opponents to go the other way. "Good losses" only get you so far. But they're set up well to win a few this season. Besides, Indiana is going to finish the Big Ten either 1st or 2nd (behind OSU), so not all of Michigan's ranked opponents will be Duke or this Indiana team. Interesting take. A couple points. To say this game wasn't close is pretty silly. Any game where you have three shots to take the lead in the last two minutes is close, regardless of selected factors. Indiana's eFG% was 62%, but UM's was 55%. That's not a significant mismatch. Say what you want about Michigan's defense and athleticism, but UM had an advatage in turnover percentage and offensive rebounding. Free throw rate was the one big factor where Indiana had an advantage. Yes, Indiana missed 7, but UM missed 4, including the front end of a one and one. Indiana got to the line 8 more times than UM, and that's probably the difference in the game. Stu Douglass is one of, if not the, best perimeter defenders in the Big Ten. He is sterotyped into a role that really isn't accurate for his game. Enjoy your work, keep it up! I agree with Andy. I think was closer than you lead on and UM had several chances despite not playing THAT great. No doubt much of what you say occurred a lot early in the game when UM let things get out of hand but I thought they settled in well. Sure they had a few lapses but IU has always been a tough place to play, one of the hardest in bball. Watford was the difference as UM had no answer for him. His inside/outside game hurt UM the most and I'd say he was the only player with a distinct mismatch and athletic advantage throughout the game. If the UM team can cut the mental lapses and play good team D they can overcome him and IU when they travel to Crisler. Watford will still go off but I think (expect) UM to win that one.